From the steamy tropics of Brazil’s Amazon jungles, comes Pau D'Arco. Derived from the inner bark of this tree, it represents life, health and longevity to the native Calaway tribe. 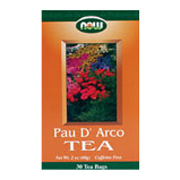 Experience the wildly exotic, zesty flavor of the Amazonian rain forests with Pau D'Arco Tea from NOW. Pau D' Arco Tea is shipped in a discrete, unmarked package. Orders are processed immediately and usually take about 3 to 5 working days to be received.. Any information received is used only for order processing and shipping purposes. Your information, such as e-mail address, will never be disclosed to a third party.